Examining the complicity rate (refers to the percentage of cases committed in complicity to the total; hereinafter the same in this subsection) of 452,048 cleared cases (excluding cases of juvenile offenders under 14 who were guided by the police and cases where it was confirmed as a result of investigation that the act in question did not constitute a crime or that the conditions for prosecution or punishment were not satisfied; hereinafter the same in this subsection) for non-traffic penal code offenses (excluding dangerous driving causing death in a traffic accident on the road; hereinafter the same in this subsection) revealed that it was high at 25.8% with cases committed by juveniles only (cases committed by a sole juvenile perpetrator or in complicity with other juveniles) when compared to that of 13.1% with cases committed by adults only (same as juvenile cases) (Source: Criminal Statistics by National Police Agency). Fig. 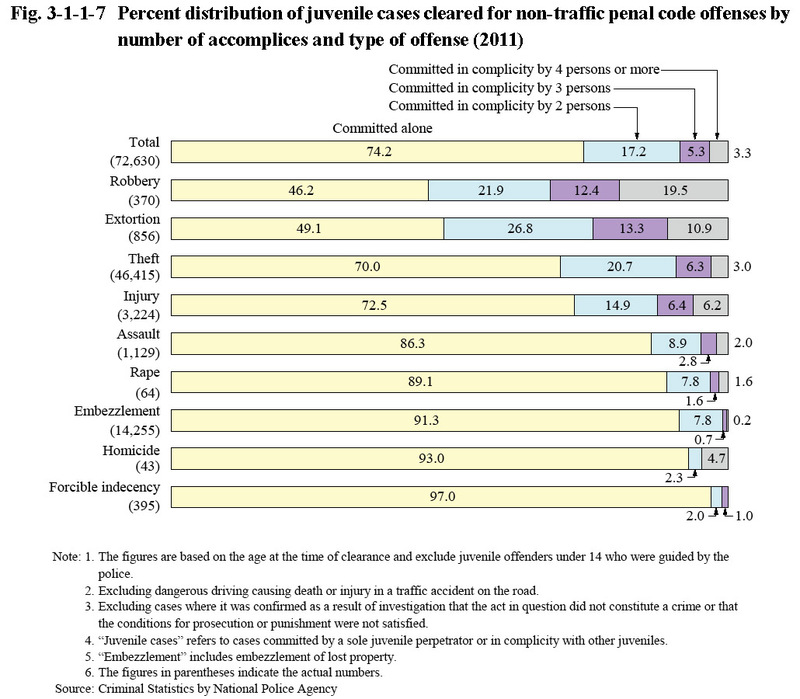 3-1-1-7 shows the complicity rate of cleared cases for non-traffic penal code offenses committed by juveniles only by type of major offense in 2011. The complicity rate was the highest for robbery at 53.8%, followed by extortion at 50.9%, theft at 30.0%, and injury at 27.5%. The complicity rate for these offenses all significantly exceeded that of cases committed by adults only (16.7% for robbery, 32.3% for extortion, 14.6% for theft, and 10.1% for injury). In addition, the percentage of cases committed by juveniles only but in complicity involving four or more juveniles was also considerably high for robbery (19.5%), extortion (10.9%), and injury (6.2%).